At the 2nd Annual Pan Pacific Orthopaedic Congress last year, David Adkison, MD, from St. Vincent's Hospital in Birmingham, Alabama, reported on a rotator cuff-sparing approach for primary anatomic total shoulder arthroplasty that he and his colleagues call the 2-window technique. The technique was developed, “because of concerns regarding healing of the subscapularis after standard deltopectoral approach for anatomic shoulder arthroplasty,” Dr. Adkison said in the abstract of his presentation. With the new, rotator cuff-sparing technique, the shoulder is exposed through 2 “windows” via a superolateral extended skin approach. “The first window is through the rotator interval and the second utilizes a limited deltopectoral interval exposure of the humeral neck distal to the subscapularis, allowing removal of the inferior humeral head osteophyte complex and limited lateral capsular release,” Dr. Adkison said. 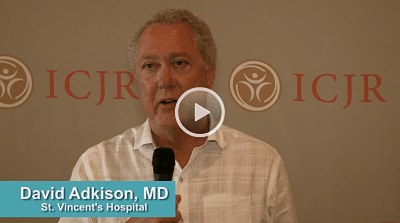 Click on the image above to hear Dr. Adkison’s comments on the 2-window technique for anatomic shoulder arthroplasty.